We are very happy to announce that we now have funded MBSR courses for G20 postcode residents who are either on Unemployment or Disability Benefit. You can self refer; apply through your GP or Community Mental Health team. 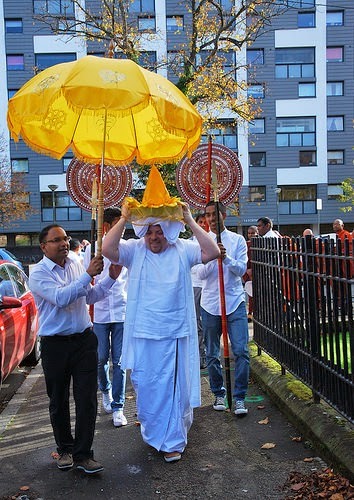 The annual Kathina Ceremony of Scotland’s Buddhist Vihara was held at Partick Burgh Halls on 18th of October from 11.00am to 3.00pm. It was very successful and well attended. The ceremony started with a beautiful parade with monks and devotees carrying the Kathina Robe for offering. 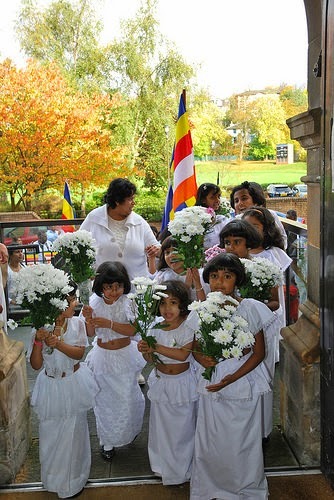 The children dressed in the traditional Buddhist children's outfit ( Lamasari) was a reminder of the Sri Lankan Kathina Ceremony back home for the Sri Lankan devotees who attended from many parts of the UK. 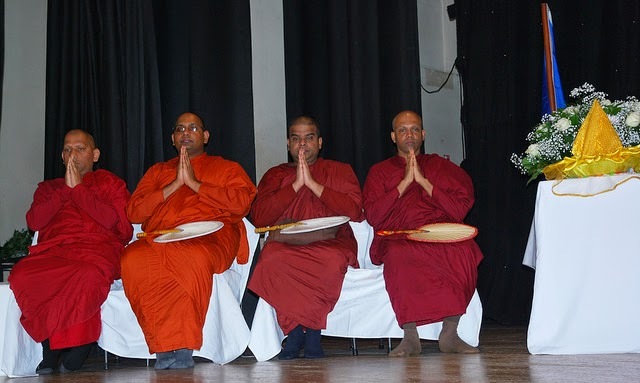 Dr W.Kassapa Thero(OBE) chaired the ceremony which was attended by monks from Birmingham Maha Vihara, Leicester Vihara and Letchworh Vihara. 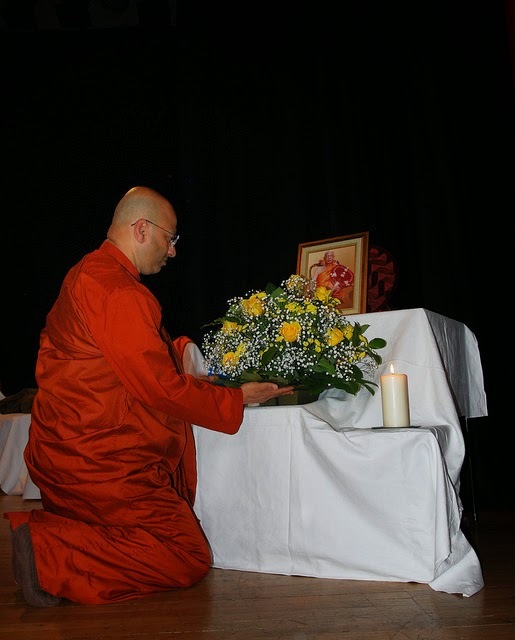 Bhante Rewatha Thero, the head monk of Scotland’s Buddhist Vihara and the chief monk of Great Britain with his Dhamma brother Venerable Palitha Thero paid their respects to the late Most Venerable Bellana Nanawimala Maha Nayaka Thero , their teacher, by offering flowers to a specially erected shrine. 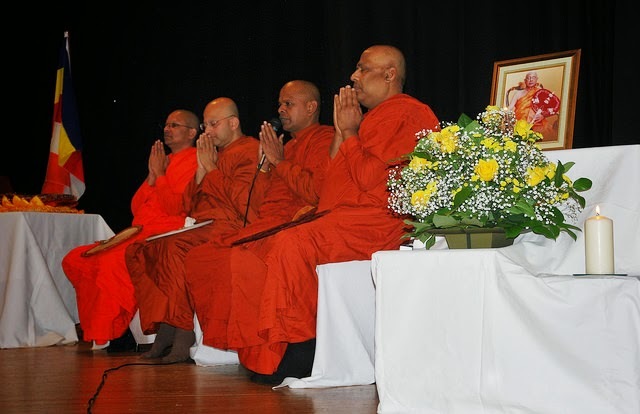 Mindfulness Meditation group to experience a traditional Buddhist ceremony. 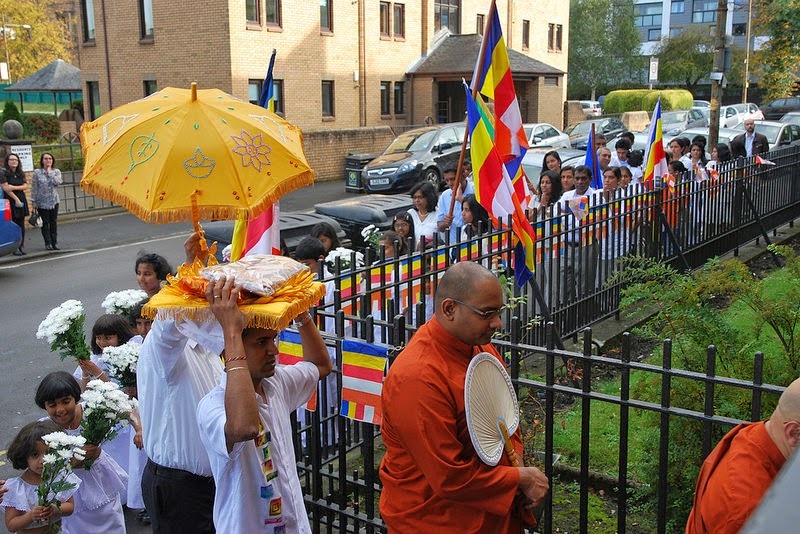 They were very fortunate to get blessings from the 8 monks who attended for the 12th Kathina Ceremony of Scotland’s Buddhist Vihara. 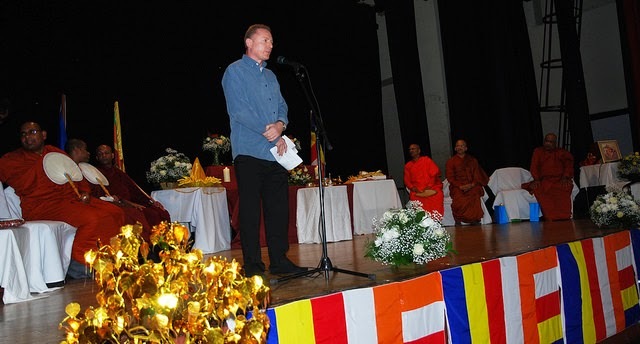 Dr Kenneth Hutton of the University of Glasgow gave a speech on Mindfulness in traditional Buddhism for the devotees and friends of the Vihara who attended the ceremony. 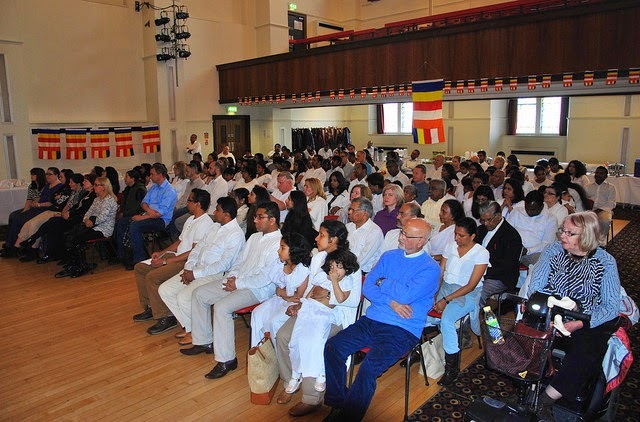 Dr Alistair Wilson, Stephanie Wilson and members of COPE mental health charity attended the ceremony along with the mindfulness group of theScottish Centre for Mindfulness which was founded by Bhante Rewatha Thero. 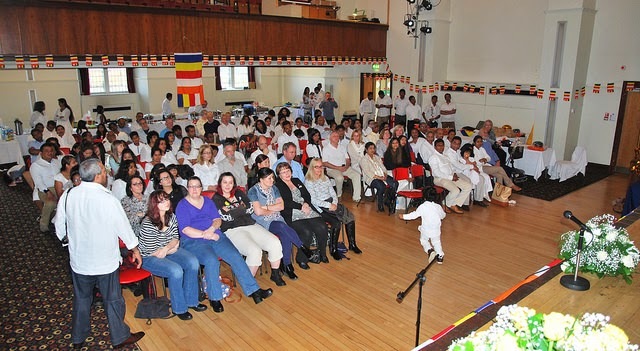 Every one was very grateful to the devotees of the Vihara for their generosity in organising this great annual event. 02:00 pm - 02:30 pm: Offering Kathina robe to the monks and the sermon of the significance of offering Kathina ceremony in Sinhala. Please be advised that if you are unable to attend for the morning events, you are most welcome to attend for lunch. The organising committee would be most appreciative if you do intend to attend, that you arrive on time. This is to ensure that the event proceeds smoothly. Children of all ages are most welcome and parents are kindly requested to supervise their children throughout the programme. Photography is permitted and your active participation is highly anticipated to make this event a success. Regular Practice Sessions for students and staff who have already undertaken an 8 session Mindfulness Based Stress Reduction programe will take place fortnightly in the Interfaith Room, led by Rewatha Thero. The sessions will take place on Thursday evenings from 5:00 until 6:00. There is no need to book, just come along.